As many of you soon to be brides are aware, ring bearer pillows tend to fall into two categories - cheesy or super expense. Often these categories are not mutually exclusive either. 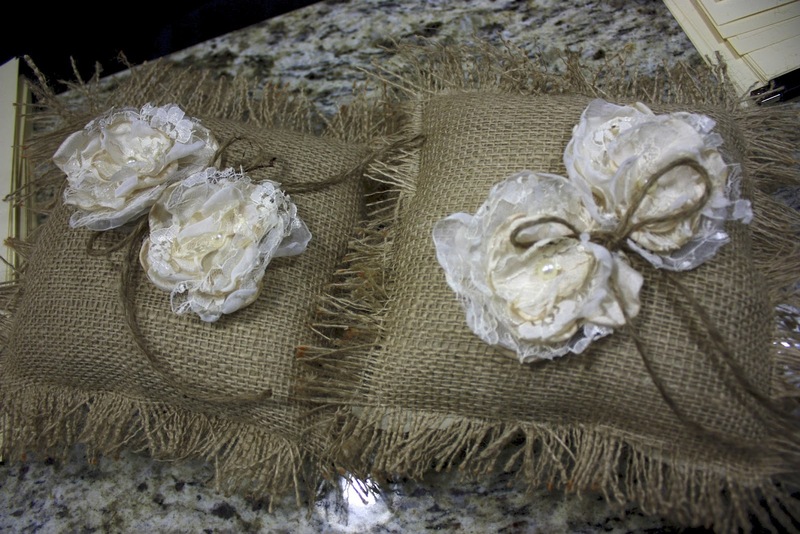 Going for my rustic mountain wedding theme, and taking inspiration from websites like etsy and pintrest I decided I would just make my own pillows, and I think they came out really awesome. I guess I would technically be lying if I said that I mad ethe pillows, I pretty much just made the pillow cases and decorated them. 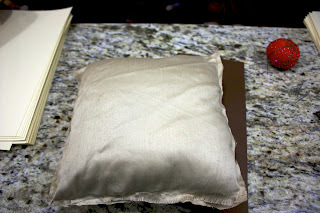 I found some cheap white ring bearer pillows at walmart and used them as my pillow. 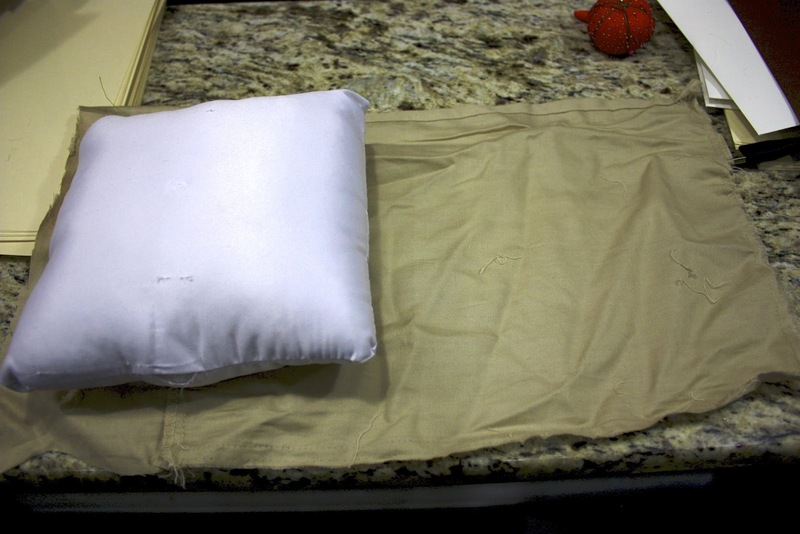 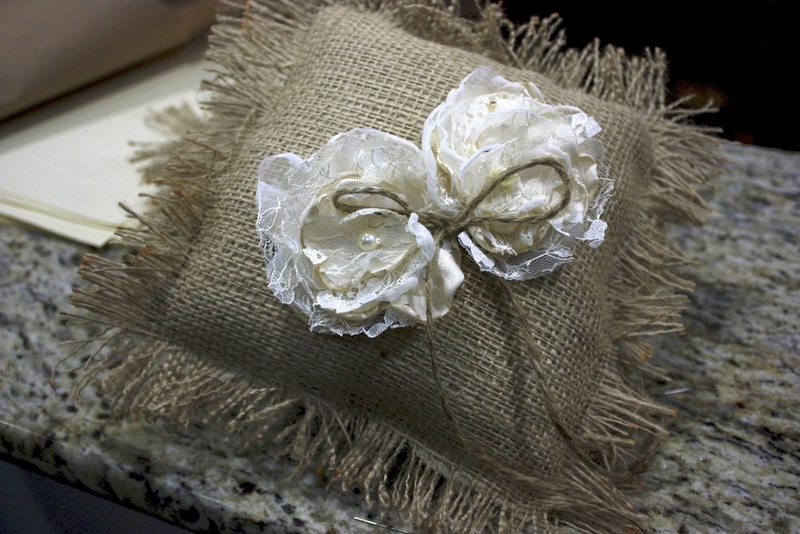 The first thing I discovered is that you could see the white pillow through the burlap fabric, so I took an old tan pillow case and cut it up to cover the white pillow. 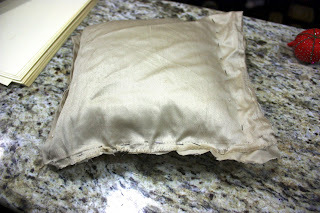 I pinned it where it needed to be, and then buzzed it though the sewing machine. 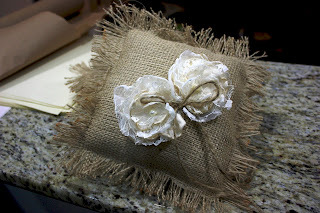 Nothing pretty - but you'll never see it anyways. 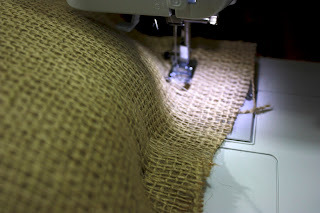 Because I was making a fringe like border around my pillows I found that I had enough space to pull it though my machine with the pillow inside. 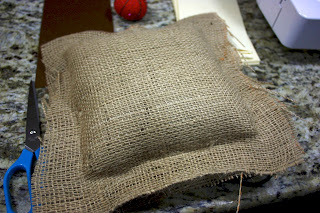 Thats what she looked like! 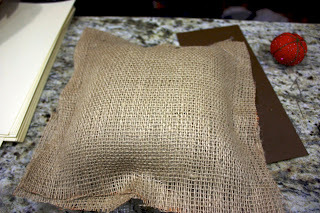 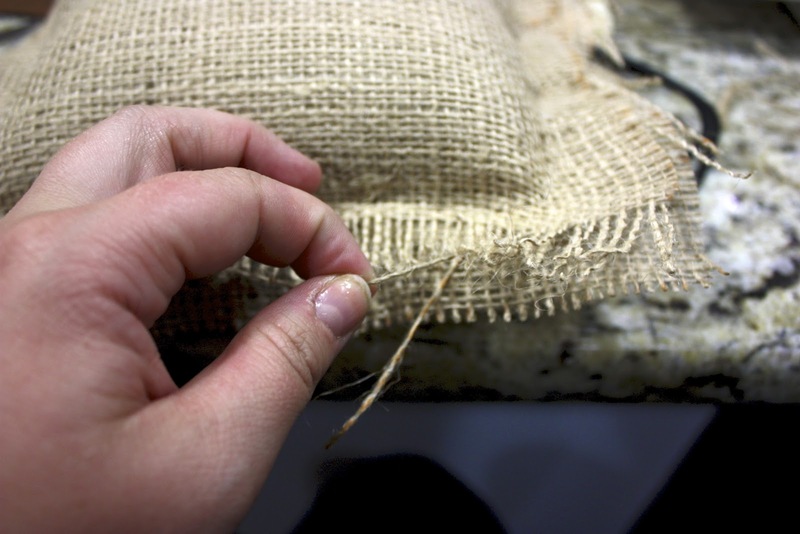 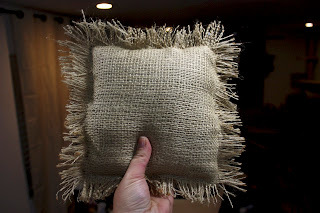 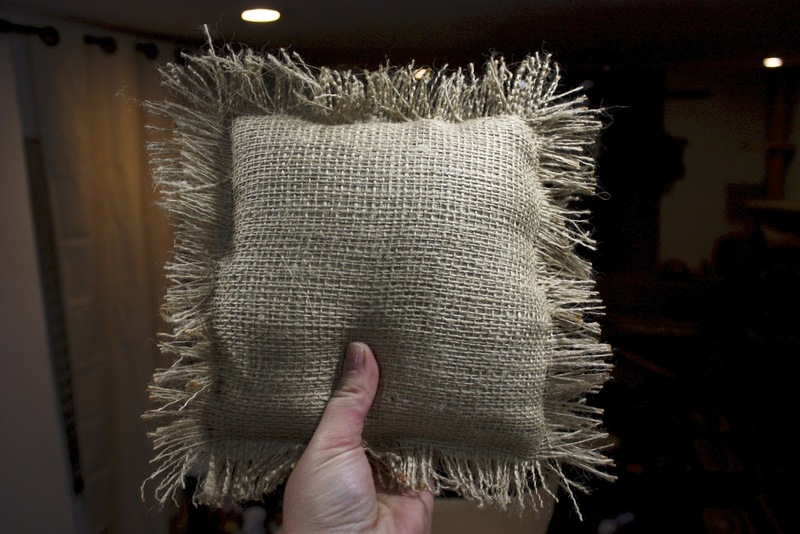 Then to fray- burlap is essentially bands of thick weaved fabric that criss-cross eachother in opposing directions, so start with one direction and pull the long string of fabric out, do this until you have enough width of fray, then take out the other sides, creating your rustic burlap pillow. See, doesnt she look great? 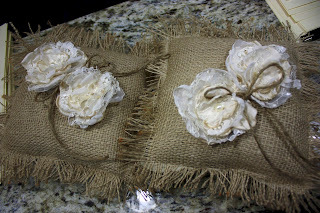 Then I found some really nice looking fabric lace flowers online, quick stiched them to the center of the pillow, and also stiched a long piece of twine in the center to the pillow (between the flowers) to hold the rings.